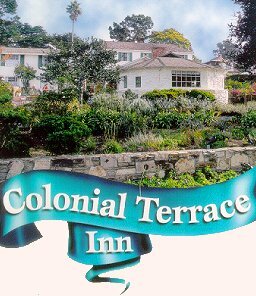 Established in 1925, the Colonial Terrace Inn is one of the original inns in Carmel. Featuring friendly proprietors, lush garden terraces and charming, spacious rooms, the Inn is a favorite destination, combining the warmth of times gone by with the convenience of modern amenities. All rooms beautifully redecorated in 2001. Each room has it's own personality and color scheme. Windows open to dramatic views, overlooking beautiful Carmel Bay. Just steps away is one of the world's most spectacular beaches with its sweeping arc of white sand and towering Monterey Pines. Listen to the gentle lapping waves and inhale the fresh, salty breezes. Our peaceful, private setting is ideal for the quiet, romantic spirit. All rooms feature the warmth of gas fireplaces and freshly brewed coffee in your own room. Several accommodations are self-contained with microwaves and refrigerators, making the Colonial Terrace Inn the perfect spot to get away, far from the cares of the world. AAA Listed. This and other Carmel Bed and Breakfast Inns can be found here in The Register. Romantic Country Inns, Getaways and B&Bs offer a great Monterey lodging alternative to big hotels.